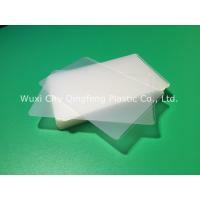 Home Companies Wuxi City Qingfeng Plastic Co., Ltd.
Laminating pouch films use polyester (PET) film as its base film, adhesive (EVA resin) is evenly applied on one side of the film. After special processing, it turned into advanced packing material, and it is widely used for the laminating and protection of material like identification card, historical accounts, photos, pictures, credit cards and important documents. setting a suitable temperature, and wait the ready light turn to green. 2. Green ready light on, and put close-end pouch into the entrance.